We’re all swamped with options. We can advertise on Facebook, Twitter, Goodreads, Amazon, Google. We can publish on a dozen different stores and several hardware platforms. We can build communities with newsletters, groups, blogs or readings. What’s an author to do with so many options? The first in our series of tools for the modern author covers a little-known tool for our Kindles. 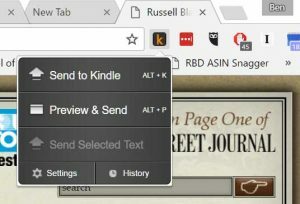 The ‘Send to Kindle’ plug-in for Google Chrome will make all that marketing research easy on the eyes. Mobile tech is built to play music, games, take calls, jot down notes, sync data, track tasks and do the laundry. But the Kindle was built to be a reading device. So instead of reading all of those helpful blog posts about author marketing on the bright screen, you can get it on your Kindle with two clicks! The articles look clean, ad-free and (mostly) image-free, making for a pleasant experience. Then click on either ‘Preview and Send’ which allows you to get an estimate of what the article will look like when it’s on your Kindle. Or click on ‘Send to Kindle’ and the article will be sent immediately. 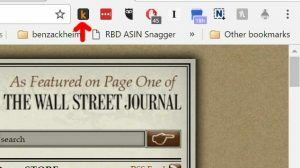 You may need to Sync your Kindle when you turn it on, but the article will usually show up within a few seconds. There have been times when long posts take a bit longer. If they fail completely then I find that trying a second time will usually do the trick.